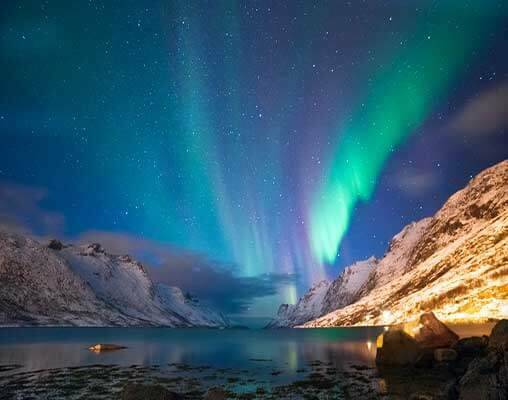 Traveling on some of Scandinavia's most scenic railroads, our tour takes us to the spectacularly beautiful Lofoten Islands and offers several opportunities to see the Aurora Borealis. On this remarkable adventure we explore Norway and Swedish Lapland, journeying north far into the Arctic Circle where we seek out the magical Northern Lights, all whilst traveling on some of Scandinavia's most scenic railroads. 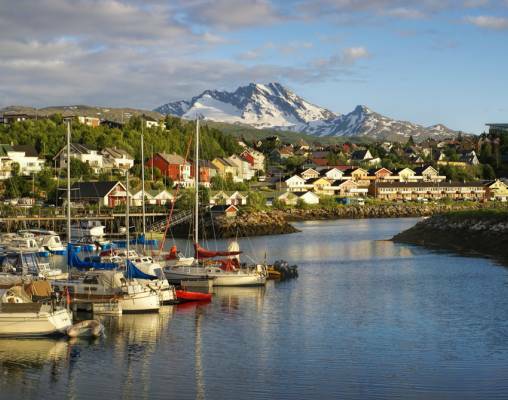 The Thon Hotel Lofoten is perfectly located in Svolvaer Harbor, within easy walking distance of the town's attractions. The hotel has a restaurant and a bar and guests enjoy free access to a local gym 200 metres from the hotel. The rooms come with a telephone, flatscreen television, free Wi-Fi internet access, a minibar and a hairdryer. 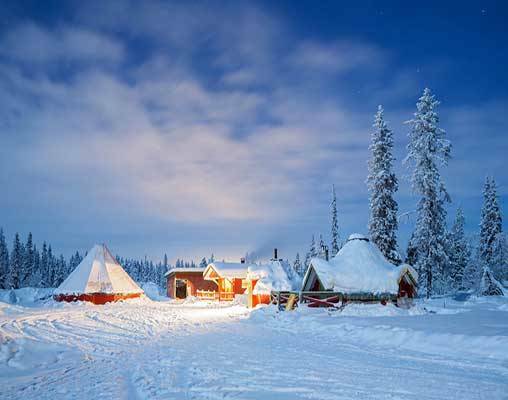 Just outside of Kiruna we stay at the 4-Star Camp Ripan, a hotel that offers that little something extra. Designed and built to reflect the nature and conservation of this area of Sweden, each room is an individual, cosy cabin, which features a television, a minifridge, and complimentary Wi-Fi. One of the main features of this hotel is its impressive Aurora Spa, with indoor and outdoor pools that are open all year round, and a sauna. There is also a restaurant, serving delicious food with local ingredients. In Bodo we stay at the 4-Star Scandic Bodo Hotel, located a short distance from Bodo railroad station. Equipped with all the expected modern amenities with tasteful, fashionable interiors and well-appointed furnishings, this is an excellent place from which to explore Bodo. Amenities include an international restaurant and a bar serving drinks from across the world. Rooms all have a television, a minibar and a hairdryer. The scenic Dovre Railroad connects two of Norway's capital cities - the current capital, Oslo, and the historic Viking capital, Trondheim. Nicknamed 'the trail of the trolls', the railroad runs on 553km of track, following a meandering route through Norway's inland countryside to provide a fascinating cross-section of scenery. Along its route the railroad passes broad farmlands, expansive lakes, babbling rivers, rich deep forests, narrow valleys and high mountain passes, while providing a snapshot of the country's fascinating floral and unique animal and bird life. The Nordland Railroad runs from the historic Viking capital of Norway, Trondheim, to the beautiful city of Bodø in northern Norway. The railroad is 729km in length, making it Norway's largest mainline railroad. It is also one of only a few railroad lines in the world which cross the Arctic Circle. The railroad, which is also called 'the train of the midnight sun', takes passengers through the beautifully varied scenery of northern Norway and includes views of lakes, rivers and fjords, as well as the spectacular Svartisen Glacier. The Nordland Railroad crosses the Arctic Circle (66 degrees north) just before reaching Lonsdal, the highest station on the line at 512km above sea level. This part of Norway is famous as an ideal place to view the Northern Lights. During the summer, in fine weather, the sun remains visible 24 hours a day. After reaching Fauske, the most northerly point on the line, the railroad turns due west to Bodø, regarded by many as the city with the world's most beautiful coastline. The Ofoten Railroad lies on a headland at the foot of the Fagernesfjellet, between the Beisfjord and Rornbaksfjord, and runs between the iron-ore mines at Kiruna in Swedish Lapland and the port town of Narvik on the Norwegian coast. The modern town of Narvik was developed as a port for the export of the iron-ore, and the Ofoten Railroad, was built at the turn of the century as the link between the mines and the port. At the time of construction, the Ofoten Railroad was both the coldest and northern-most railroad project in the world. The 26-mile (42km) line was painstakingly carved out the mountains - an incredible engineering project that was largely undertaken by hand. The result is a breathtaking route which takes passengers past deep fjords, through the wild, rugged mountains and the barren mountain plateaus north of the Arctic Circle. The Ofoten Railroad Museum is dedicated to the local history of Narvik and the Ofoten Railroad, and is located close to the center of Narvik. Enter your details below if you would like to be notified when 2021 dates and prices are available for The Northern Lights & Lapland.